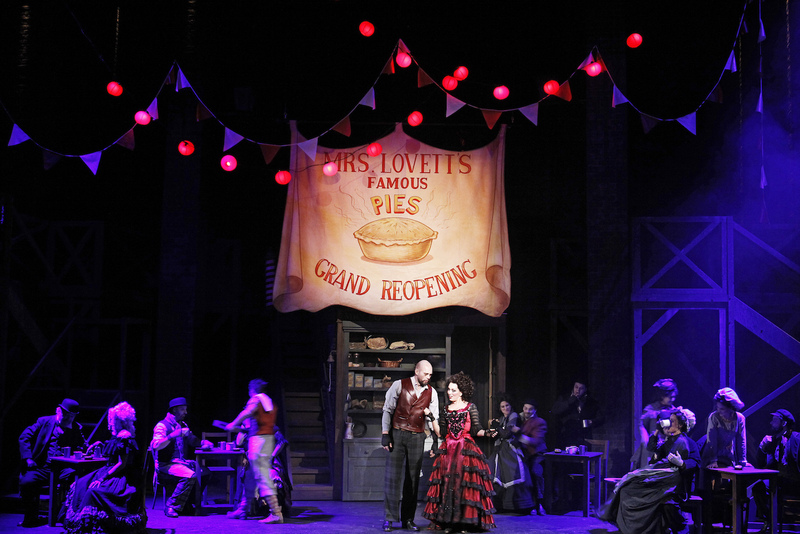 Sweeney Todd proves an excellent choice for the third installment of Victorian Opera’s Sondheim Trilogy. The quasi-operatic style and form suit the company, which again proves far more adept at casting its regular artists than Opera Australia has with its recent musicals. 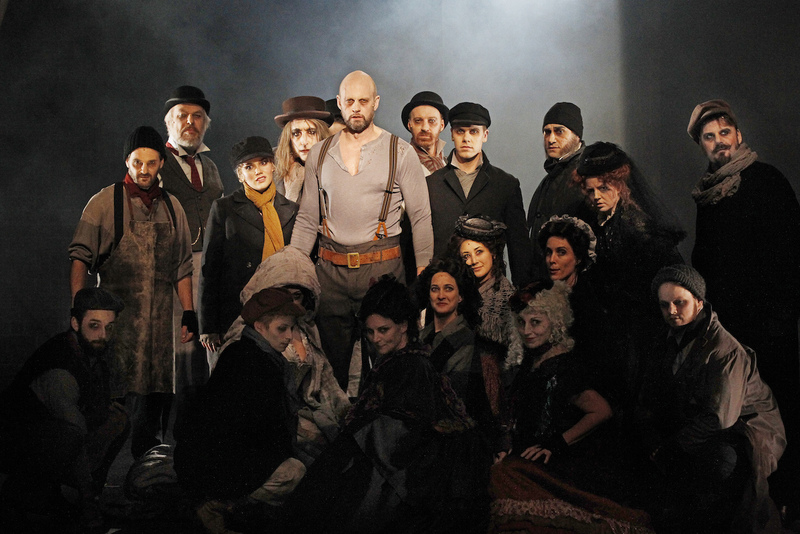 A partnership with New Zealand Opera allows a higher budget for Sweeney Todd, which is put to excellent use in this handsome, expertly realised production. The staging of this intricate work benefits from being housed in the relatively intimate space of the Playhouse Theatre. At stage level and higher, the action is mostly played downstage, facilitating a close bond between audience and performers. Director Stuart Maunder has clearly mined the text for full meaning and impact. Every word lands with crisp clarity, not just vocally but contextually. Maunder creates a slightly heightened sense of each character while still maintaining as naturalistic an atmosphere as the bizarre menagerie of characters will allow. Storytelling is crystal clear, and while there is plenty of welcome humour to relieve the tension, the overall lack of melodrama allows the climactic twists to be keenly felt. Masterfully thorough preparation by musical director Phoebe Briggs results in a highly polished performance of the fiendishly challenging score. The twelve musicians from Orchestra Victoria must be of the highest calibre as the music has the richness of a larger orchestra. Percussive colour is expertly brought out by Conrad Nilsson, enhancing the music and onstage drama alike. Briggs and Maunder are well served by twelve supremely talented ensemble members. Each performer delivers fascinating character work and sings the score with impeccable accuracy. Harmonies are precise, with act two piece “The Letter” being a particularly haunting highlight for the five singers involved. While a couple of cues were missed on opening night, Jim Atkins’ sound design is clear and well balanced. Designer Roger Kirk fills the height, width and depth of the stage almost to overflowing with a sturdily constructed depiction of industrial Victorian London. Wooden stairs and walkways represent docks, balconies and bridges, with central settings entering through two massive rear dock doors. Flexible use is made of the large revolving unit that houses Mrs Lovett’s notorious establishment. The audience is thrilled by the mechanism of Sweeney’s gleaming barber’s chair. Kirk’s costumes are impressively individual for the full company. An example of the high production values comes in the elaborate masks for the brief flashback to Judge Turpin’s ball. Pirelli’s faux-regal garb is amusingly gauche, Toby’s colourful stripes are endearingly boyish and Johanna’s pale pink dress is sweetly angelic. The onstage costume change of the ensemble from townsfolk to asylum inmates is a clever touch. One odd choice is that Mrs Lovett’s flashier red and black ruffled gown, afforded when business is booming, is too similar to her plainer red and black ruffled gown. Also, hair, make up and attire make the Beggar Woman look distractingly like Grizabella*. Beginning with the slow build of the Prelude, Philip Lethlean’s lighting design adds layers of atmosphere and tension, deliberately only allowing the eye to see the intended focus. Kirk’s design and Maunder’s fluid direction are both enhanced by the lighting. 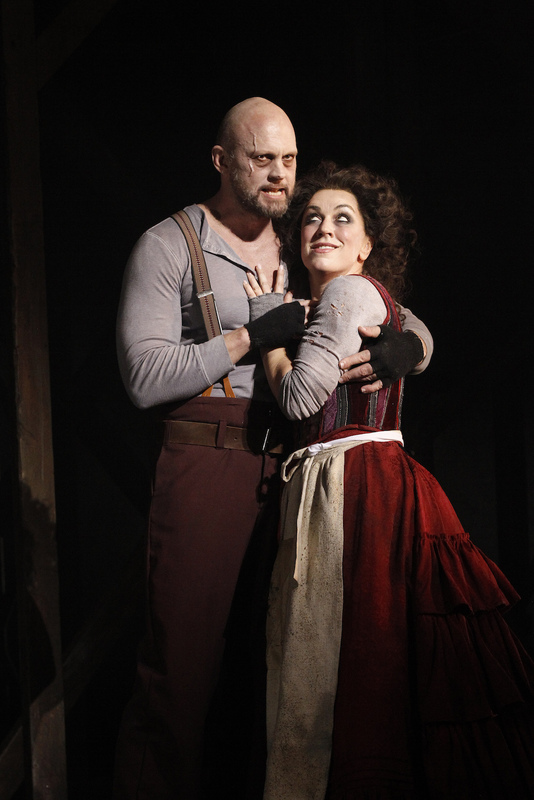 Creative input aside, a production of Sweeney Todd largely stands or falls based on its lead performer. Teddy Tahu Rhodes has the authoritative vocal darkness and solemn introspection well covered, but his overall performance is undone by shortfalls in has acting ability. Foremost in this regard is Rhodes’ inability to shake his New Zealand accent for the dialogue. His performance reaches a peak around the end of act one, with a powerful rendition of “Epiphany” followed by a suitably straight foil to Mrs Lovett in choice comic duet “A Little Priest.” His singing and acting in murderous act two sequence “Johanna” are pleasing. Of particular disappointment, however, is Rhodes’ underwhelming delivery of Todd’s reaction to the ultimate tragedy of his actions, which undermines the power of the climax. Accomplished soprano Antoinette Halloran is an utter delight as Mrs Lovett, wickedly gaining our affection while the character commits all manner of fiendish deeds. Although looking perhaps just a tad too clean and pretty, Halloran’s performance is faultless, clearly conveying the desperate but ingenious machinations of the wily survivor, a woman so gruesomely vain that she checks her reflection in a butcher’s knife. Handsome tenor Blake Bowden is quality casting as Anthony, singing the role beautifully and capturing the wide-eyed innocence of the unsullied young man. New Zealand-born Amelia Berry imbues the fair Johanna with a lovely soprano. In a well-considered acting choice, Berry plays Johanna as manically unbalanced herself while unfairly imprisoned in the asylum. Versatile performer Ross Hannaford conveys the bubbling energy and endearing pathos of stray waif Tobias. Appearing as little more than a teenager, Hannaford sings the role with flair and gusto, maintaining an endearing vulnerability in the character despite the underlying confidence of his performing skills. Chameleon-like performer Kanen Breen creates another highly memorable characterisation as slimy Beadle Bamford. His parlour songs are quite hilarious and the flick of his long hair as he sets off for a shave, not knowing it is to be his last, is a hoot. While Phillip Rhodes is a touch too young and handsome for the insidious Judge Turpin, he nonetheless portrays the unconscionably vile man with flair. Based on the overall tone of the production, Judge Turpin’s self-flagellation reprise of “Johanna” (occasionally reinstated after being cut from the original production) is wisely omitted. Hopefully a future appearance will allow more of Rhodes’ fine baritone to be heard. Excellent mezzo-soprano Dimity Shepherd immerses herself in the role of the wretched Beggar Woman, unrecognisable beneath the rags and greying wig. Shepherd’s presence and reactions throughout the tale reward viewers who know the full story. David Rogers-Smith channels his former starring role as The Phantom of the Opera’s Piangi as vainglorious barber Adolfo Pirelli. In an example of the clarity achieved by the direction and the intimacy of the performance space, the exposure of Pirelli’s true colours comes across brilliantly. Sondheim fanatics and music theatre lovers in general will appreciate the loving care that has gone into this production. Reservations about Rhodes’ acting are largely compensated by the strength of his singing and the overall quality of the full cast. 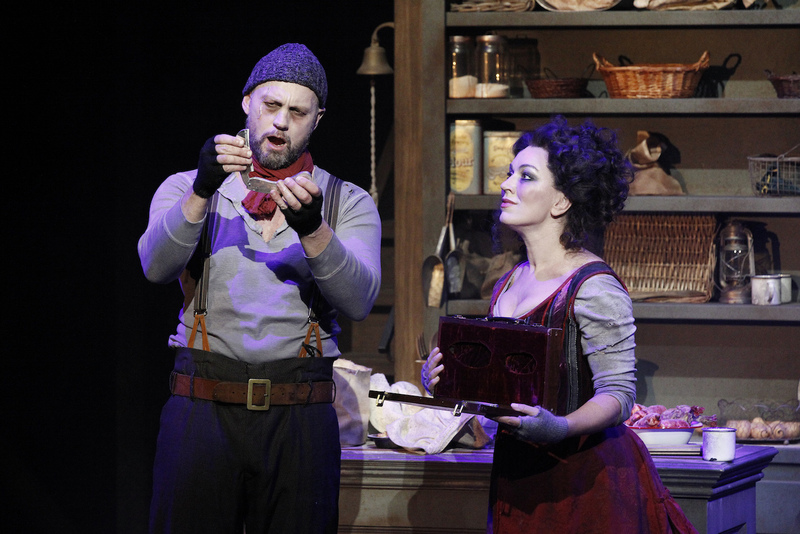 Sweeney Todd plays at Playhouse, Arts Centre Melbourne until 25 July 2015. The Sweeney Todd program can be read online. Ah, glad to hear that Mark! Interesting, given your cinematic focus, that Sondheim thinks of this musical as a movie. I guess you can imagine how a Sweeney who can’t act would spoil proceedings..